INDUSTRY-LEADING PERFORMANCE Give your children the exhilaration they want with a vehicle they can handle. Designed for riders 6 years old and up, the DS provides the perfect platform to build their skills. 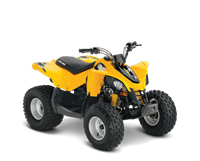 CERTIFIED CARB “GREEN LABEL” Available in 69 cc or 89.5 cc, the 4-stroke engine is certified CARB “Green Label”. ALWAYS IN THE RIGHT GEAR Continuously Variable Transmission means the drive shaft is always in the right gear. And its forward / neutral / reverse capability keeps kids from worrying about shifting gears or getting off the vehicle to go in reverse. TWO START OPTIONS Get going quicker with the convenient push-button electric start, or get started with the traditional kick-start. PRECISION-ENGINEERED HANDLING Long travel suspension provides a smooth ride and more control through bumpy terrain, making learning to ride easier. SMOOTH RIDE A long travel suspension delivers a smooth ride with more control in the bumps. RIDER-FOCUSED DESIGN We take great pride in making sure our young riders have what they need to improve their off-roading skills. This ride comes with neutral, reverse, and oil temperature lights and a built-in throttle limiter so parents are in control. ADDED PROTECTION Ensures secure footing and protection from debris, bumps, and rocks. ADDED VISIBILITY Day lights add the visibility and looks of a full-size ATV. CONVENIENT FRONT STORAGE Front storage compartment makes it easy to bring along what you need or take home what you find. EASY TO OPERATE Easy-to-use key-operated ignition switch. PARENTAL CONTROL Built-in throttle limiter so parents can keep their child's speed under control.